Not the biggest price in the world, but still a generous one. Liverpool are yet to drop a point this season against teams outside what is now a firmly-established top five, while Bournemouth only ended a four-game losing streak with an ultimately nervy 2-1 win over struggling Huddersfield. Despite that poor run, Bournemouth are still enjoying a solid season. But it has been built almost entirely on results against their peers. They have already lost to Arsenal, Manchester City and Manchester United this season, with a point against Chelsea their only success of any kind against the big boys. What the Cherries undoubtedly do possess is a goal threat. Only the top five have scored more goals than Bournemouth’s 25, and they found the target in each of those defeats against Arsenal and the Manchester clubs. Despite Liverpool’s awesome defensive displays this season, there is a case to be made here for boosting that price all the way to 2/1 by adding BTTS to the equation. Liverpool did, after all, concede midweek at a Burnley side having a far harder time of it than Bournemouth. Jurgen Klopp’s team have conceded in half their six Premier League away victories to date. One of those games was at Leicester, a very similar team to Bournemouth: comfortably mid-table and boasting genuine goal threat. BACK LIVERPOOL TO BEAT BOURNEMOUTH AT 3/5! And speaking of Leicester. They face Tottenham this weekend and will once again be without Jamie Vardy. That’s a massive blow for the Foxes given his record against big teams in general and Tottenham in particular. He boasts four goals and three assists in seven games against Spurs, and scored in both games against the Londoners last season. Harry Kane also scored in both fixtures last season – both men scored twice in Spurs’ freewheeling 5-4 win on the final day of the season. With Kane having scored in each of his last three Premier League games, were Vardy fit we’d be straight in on the 9/2 anytime goalscorer double. Alas, we have to look elsewhere and in Vardy’s absence Spurs look good for the points at even money. Spurs haven’t always fully convinced this season but their results in precisely this sort of fixture merit respect. They’ve won seven of nine away games this season, and nine out of 10 against teams outside the ‘big six’. A closer look at those seven away wins reveals that five of them have been by a one-goal margin. You can get a very fair 11/4 on that here, but let’s push the boat right out with a correct-score punt on the 2-1 Spurs win. Leicester’s two home defeats this season have come against the two strongest sides they’ve faced at home thus far – Liverpool and Everton – and both those games ended 2-1 to the visitors. That was also the scoreline when they lost at Manchester United on the opening night of the season. 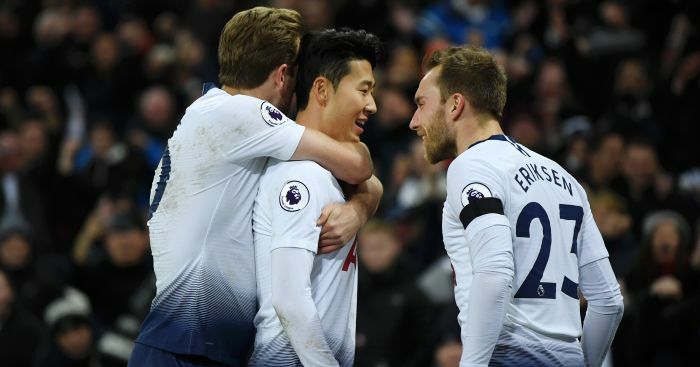 The Foxes have scored in all but one of their Premier League games this season, while Tottenham have kept only one clean sheet in their last six league games despite winning four of those, while two of their away wins have been by a 2-1 scoreline. Spurs and BTTS is another 11/4 shot well worth considering here. Leicester are on a six-match unbeaten run, but that stat conceals more than it reveals. They’ve played none of the big guns in that run, and drawn four games that looked winnable on paper against West Ham, Burnley, Brighton and Fulham. They have lost all five matches this season against teams currently in the top eight. BACK TOTTENHAM TO BEAT LEICESTER 2-1 AT 8/1! We’ll stick with that game here, where goals can be expected and greater responsibility falls on the home playmaker in Vardy’s absence. Maddison has scored five goals in the Premier League this season – enough on its own to catch the eye at the price – but it may also be significant that those goals have come in two batches. He scored three in five games at the start of the season. After a six-game run without a goal he’s now scored in back-to-back games for Leicester and has every chance to add to his tally against a Spurs defence that looks less secure than in recent years. BACK JAMES MADDISON TO SCORE FIRST AGAINST TOTTENHAM AT 9/1! Liverpool and Tottenham look good things at the prices against Bournemouth and Leicester. Arsenal are in fine fettle and should have few problems at home to Huddersfield – the Gunners might even get a half-time lead for the first time this season in that one. West Ham have won back-to-back games in good style since a thrashing against Man City that is irrelevant when considering a game against a Crystal Palace that’s lost six of its last nine in the Premier League. The 13/10 for a Hammers win at the London Stadium is without doubt the best odds-against quote on this weekend’s coupon. Everton slipped up slightly in a 1-1 midweek draw against Newcastle but had won four on the bounce at home before that and should have too much for the Hornets, who have lost four of their last five. BACK THE WEEKEND ACCA AT 16.03/1!